Some cases require additional treatments to replace missing bone. 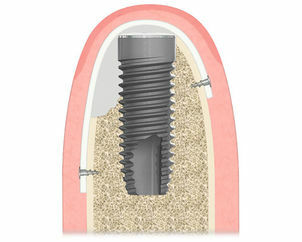 Before dental implants can be placed, the bone under the gum must be tall and wide enough. If it’s not, it can be regenerated to accommodate an implant. Regeneration can be achieved in several ways. Depending on the type, location and number of implants required, your dentist will decide on the best treatment for you. Additional treatments will increase treatment time. For major regeneration treatments, additional treatment time of several months may be required. This involves adding bone or bonelike materials to your jaw to regenerate it. Your own bone can be used and this is often a good solution, but other graft options are available. Surgically placed, sterile membranes create a space between the bone and gum where new bone can grow. This makes it possible for your own bone to form with or without the addition of bone substitutes.